Exec Editor @London_360 TV Radio Digital Broadcaster. 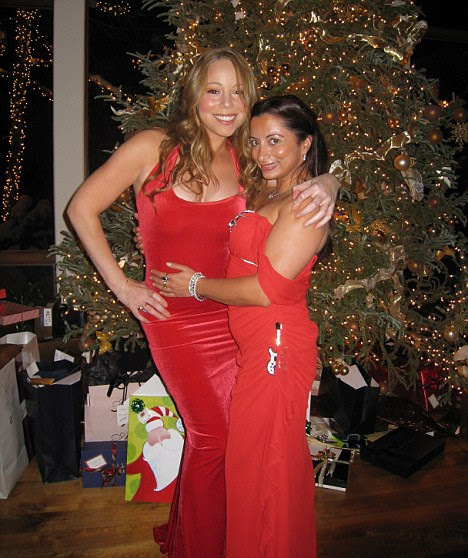 Jasmine Dotiwala and her mate Mariah Carey. The elderly Asian proprietor of a corner shop in the West London suburb of Southall is stacking shelves when events take a surreal turn. A limousine pulls up and out leaps a bodyguard. From the back seat emerges a glamorous woman in a figure-hugging dress and skyscraper Christian Louboutin heels. She is not from Southall; she inhabits a starrier stratosphere. Yet she walks into the shop, picks up a wire basket and wafts along the aisles on a cloud of costly fragrance. At the check-out, the proprietor, slack-jawed with amazement, puts her shopping in a box. It is a prosaic selection; there are no luxury items for sale in this shop. Then the woman and the bodyguard carrying the box of groceries get back into the waiting limo and are whisked away as quickly as they came. The mirage fades as suddenly as it appeared, but the shopkeeper will remember the woman for years to come. His unexpected customer was the American singer Mariah Carey, the most successful female recording artist in history. What was she doing in this unglamorous corner of London? She had come to visit me. Knowing I was sick and languishing on the sofa at my mother’s house with a searing temperature, she had come straight from filming the Graham Norton TV show with the intention of cheering me up. Though she is stupendously rich and I am relatively poor, it is a friendship of equals. She visits me in my small home; I am a frequent guest at her various mansions and holiday villas all over the world. And it was a typically impromptu gesture of friendship that brought her to my mother’s modest two-bedroom house to see me that day. Actually, at the time I was feeling less than hospitable. Dressed in a grubby old dressing gown and almost delirious with a fever, my hair lank and my face bereft of make-up, I looked like death and felt dreadful. And I felt acutely uncomfortable that my stupendously wealthy friend had swooped into my childhood home without warning, like some migrating exotic bird. I’m not remotely ashamed of my origins and I knew my Indian-born mother, Roshan, would not accord Mariah any special treatment – she is not remotely fazed by celebrity – but I did feel awkward. Couldn’t she have visited on a better day when I was feeling fine and the house was spruce and tidy? ‘Really, you don’t need to come – Jasmine’s so ill she can’t even get up,’ my mate Monique had implored Mariah when she’d phoned. But, true to form, Mariah had insisted that she would visit. She was on a goodwill mission to lift my spirits. And she was hooting with laughter as she unpacked the box of goodies she’d chosen for me. There was a bottle of Alize liqueur – favoured by the rap artist P. Diddy – which Icouldn’t drink because I was on antibiotics. Neither could I manage a sip of the plonk she’d chosen. Her hamper also included a bag of self-raising flour – to help me rise from my sickbed – chocolates and a packet of (ahem) jumbo-sized sanitary towels. All the items were hand-picked to make me chuckle. And, of course, they did. Mariah is clever at choosing the right gift for the occasion. Even her joke presents are thoughtful. And often – though I beg her not to spend money on me – she is embarrassingly generous. She has given me many lavish gifts while instructing me to spend no more than £25 on her. How had the paths of our disparate lives crossed? Twelve years ago, when I was a news presenter for the music channel MTV, I was asked to interview Mariah at a villa on her favourite island of Capri. I knew her by reputation only. An alto with a prodigious five-octave range, she had recorded a string of successful albums – among them Merry Christmas, Daydream and Butterfly – that had earned her vast wealth and huge international celebrity. And her reputation as a grade A diva preceded her. ‘I can’t believe you’re sending me to see her!’ I wailed, as my boss dispatched me. I visualised a morning spent pandering to the inflated ego of a prima donna. But she defied my expectations. She was sharp, witty and funny. We soon discovered we shared a dry and rather British sense of humour. When I emerged, dripping wet, I realised with dismay that, though I’d brought a full change of clothes, I’d forgotten to pack spare knickers. ‘I’ve really enjoyed meeting you. Give me your number and I’ll call you,’ promised Mariah as I left. But to my huge surprise, she did. I was driving home from work a couple of weeks later when a call came through from one of her aides. ‘Are you free to speak to Miss Carey?’ she asked. ‘Sorry, I’m not,’ I replied. ‘I’m driving at the moment. But I’ll be home in ten minutes if she’d like to ring me back.’ I thought I’d better arrange that in case I crashed my car from shock. She did – and so our unlikely friendship began. In that first meeting, we talked about music and struck up an immediate rapport. If I had to speak for Mariah, I’d say she probably likes the fact I’m opinionated and outspoken. She also calls me ‘festive’, which in her lexicon means I’m always up for a celebration and having fun. There’s no doubt, too, that she’s an Anglophile. She adores the British accent – whether it be the Queen’s or a Cockney’s – and she does a pretty passable impression of it. And I think she values the fact I am always honest with her – the people on her payroll may find it harder to speak their minds. Certainly, I can’t compete with her lifestyle. I live in an unassuming flat near the vibrant, but impoverished area of West London where I was raised. My two bedrooms are so small that if you joined them together they would still fit into one of Mariah’s bathrooms. So I confess I felt a little self-conscious when, on one of her fleeting, last-minute visits to London, she phoned to ask if she could call by. My embarrassment was compounded by the fact I was entertaining friends for dinner. ‘Are you in? Can I pop over?’ she asked. I sounded hesitant. Mariah was mock distraught. ‘If you don’t want me, I’ll just go straight to the hotel,’ she laughed. ‘Oh no, come on over. Shall I save some food for you?’ I said. She said not to worry because she’d bring a take-away. And so it was that Mariah breezed into my tiny flat laden with enough food from the exclusive Mayfair restaurant Nobu to feed herself and all my guests. We ate two dinners that evening, to the accompaniment of much laughter. Then Mariah, whose capacity for hard work is legendary – I have known her to go for 41 hours without rest – dropped into a deep sleep in my sitting room. She is great company and the consummate dinner party guest. On other occasion when she dined at my flat with my friends, she stopped off at Tesco en route and arrived laden with carrier bags containing salmon, sea bass and spinach, which she helped me cook. The only thing our palates differ on is spices – I love food very hot and she doesn’t. I’ve often been impressed by her eagerness to embrace everyday experiences; the more prosaic, the better. After performing in a concert in Hackney, East London, she insisted on accompanying me to my favourite bagel shop in nearby Brick Lane. The area is known for the authenticity of its curry houses, its colourful ethnicity and a distinct aura of edginess and danger at night. I advised Mariah to stay in her limo while I bought the bagels. ‘Child, I’m from New York City. I ain’t scared of nothin’!’ she hammed, sweeping into the shop with me. We stood in the queue together under unforgiving fluorescent strip lights while the other customers looked on in disbelief. ‘Will you sign this for my daughter?’ demanded a burly local, proffering a creased scrap of paper and a pen. Mariah duly obliged. Five minutes later, the man returned. ‘Could you do it again? You’ve spelt her name wrong,’ he grumbled. Mariah dutifully supplied a second autograph. As well as her kindness to her fans, she can be more than generous to her friends. Once, knowing I’d never been to Disneyland, she flew me to Florida as a surprise treat on my birthday while we were en route to her New York home. Like an excited child wide-eyed with delight, she dragged me round all her favourite rides. ‘You don’t know about the Tower Of Terror? Come on, you have to try it!’ she said. Obviously, the stories about Mariah being diva-ish persist. But I believe they spring from the fact that for many years she was dominated – brainwashed even – by certain people who had shaped her early career. She has said she was emotionally abused by her first husband, the record company executive Tommy Mottola, who signed her to his Columbia Records label. She was told she had a ‘bad’ side of her face that should never be photographed. So, she would forbid anyone to sit on her ‘wrong’ side during interviews. While the Press leapt on this foible as evidence of her overweening vanity, it was simply that she was doing what she had been told. So, too, with the flunkey pictured toting her handbag. She had been told she should never carry a bag because ‘It doesn’t look right’. It was not that Mariah deemed herself too important to carry her own bag; she was only obeying orders. On one occasion, we were swimming off her private yacht in the Med. As Mariah climbed on board after our dip, I handed her a towel. A skulking paparazzo captured the moment and the next day a headline proclaimed: Mariah Even Has a Towel Handler! I laughed at the absurdity of it, but in this way the myth of Diva Mariah is perpetuated. She is far from blase about her lavish lifestyle. Despite her riches, she still views the world with wonderment. Once, when I was distraught about the break-up of a romance, she insisted I stayed for a few days with her in her apartment in New York. Though her schedule was punishing, she fussed over me like a mother hen. ‘Are you OK? Do you want to go to yoga or will you come to work with me?’ she asked each morning. Every Christmas she invites me, along with four of her closest girlfriends and their families, to her ranch in Aspen, Colorado. My parents are Zoroastrians – an ancient Persian religion – and have never celebrated Christmas, so I have no qualms about leaving them during the festive season. And as an only child, I relish the sisterly companionship of Mariah and her family. She always says that she’s eternally 12 years old, and that’s how I see her. She has a sense of childlike awe about Christmas. After Santa with a reindeer-drawn sleigh visit, we stay up all night on Christmas Eve wrapping presents. She’s introduced me to the joys of rolling in the snow clad only in a bikini and then leaping into a hot tub. On Christmas Day morning, still in our pyjamas, we spend three hours unwrapping our gifts, then have a nap before emerging in gorgeous red dresses for dinner. Afterwards, we’ll fly off to her holiday home in the Bahamas. Mariah swims like a mermaid. I’m a timorous swimmer, so she’ll tow me along as a lifeguard would a floundering novice. Protectiveness is one of her qualities. I know she’d make a wonderful mother and she’s told me she would love to have children. She and her husband Nick Cannon, 30, a comedian, actor and businessman who hosts Simon Cowell’s America’s Got Talent, have been married for a year. Only once have I felt I could offer Mariah a treat comparable to the ones she routinely lavishes on me. Through my work contacts as a TV producer and director, I was able to take her to meet Richard Branson at his private paradise on the Caribbean island of Necker. We spent a blissful few days there – on one evening, we lay on a rooftop talking and looking at the stars. I was thrilled that I had arranged for her to visit such a fabulous place, but I suspect that if you were to ask Mariah, she would say she had every bit as much fun sitting at the dining table in my cramped London flat sharing a laugh over a home-made supper and a cheap bottle of wine.